It was not just any day. 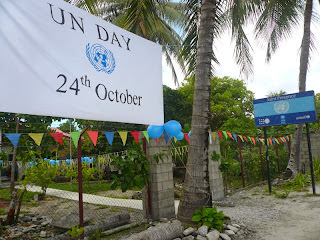 24 October witnessed a very different atmosphere at the United Nations Joint Presence office in the Pacific country of Kiribati. Charged with excitement, festivity, decorations, balloons and the sound of footsteps of children, UN agencies and partners who are friends of the children and the UN, welcomed UN Day. United Nations Joint Presence office in Kiribati has a new look! This year the UN in Kiribati decided to take an innovative approach to bring children closer and help them to understand why we do the things we do and why we are good at it. So, children and partners were invited to visit and learn more about us. UN Women, UNICEF, UNFPA, UNDP and WHO gathered at the UNJP compound. The office turned into a child centered place with balloons, traditional decoratons with coconut leaves, posters, pamphlets, books and information corners hosted by each UN agency. 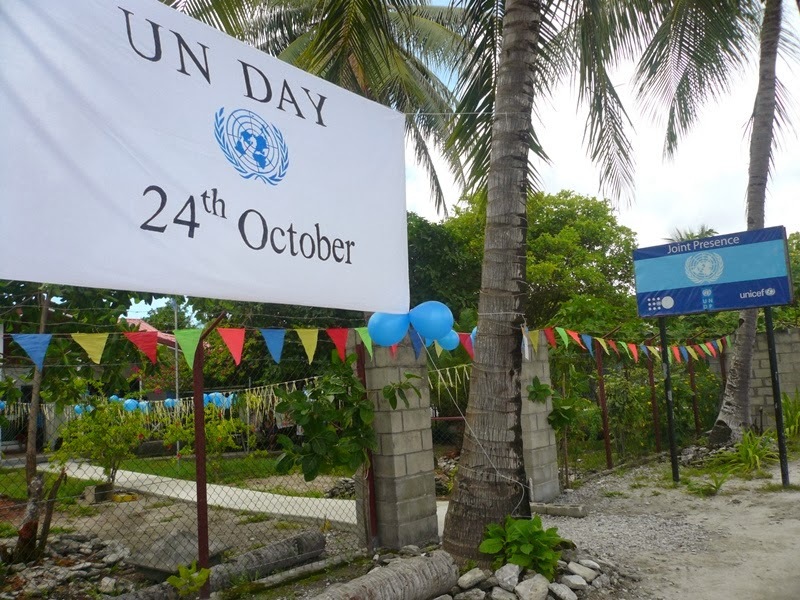 This was the first time, ever, that the UN Day was observed at the UN Joint Presence office. Also, for the first time since UNJP has begun operation in Kiribati, the Australian High Commission hosted the UN flag in its office premise to express solidarity with us. 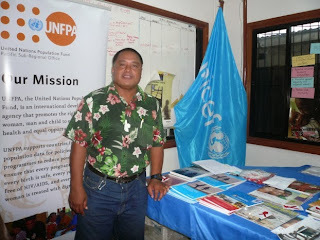 The UN Joint Presence manager explained about the role of the Joint Presence and the UN in general in Kiribati. Children were especially interested to understand the reasons for domestic violence and what adults are doing about it. Staff from UN Women presented the information, highlighting the fact that 68 per cent of girls and women are victims of domestic violence in Kiribati, and responded to their queries. In some information booths, government partners co-led with the UN staff, re-confirming our strong partnership. UNICEF staff presented information on nutrition: malnutrition is a challenge for the country, especially for children under the age of five. Children and partners had many questions about how the UN works and what value they bring to Kiribati. The informational materials were helpful to the visitors. 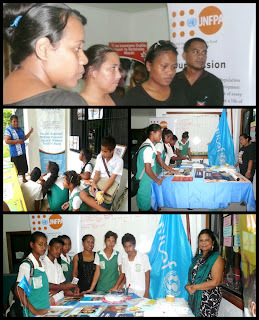 UNICEF staff explained about risky behaviour that many children and young people are engaged in and the consequences. She talked about HIV and other STIs and how these are transmitted, the need for smart and healthy life choices that protect people, especially adolescents and youth from such infections. Our colleagues tried to help children understand what MDGs are and how much of the goals has been achieved so far in Kiribati. 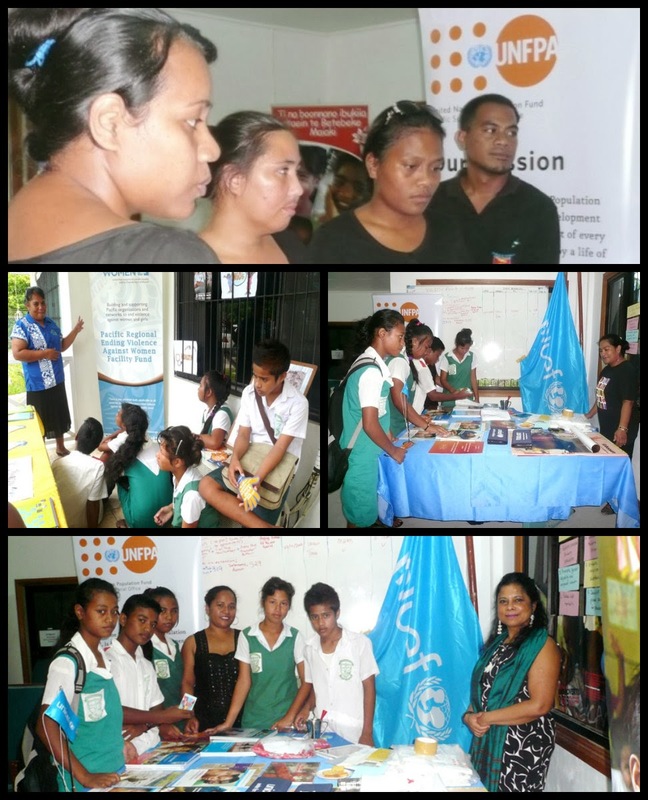 The media and politicians were also interested in our activities on the UN Day. Children were surprised when informed about the child mortality rates- For every 1000 live births, 47 die before the age of five. Diarrhoea and pneumonia are two major killers of children in the early years. “Meena” video films were screened at our conference room. As the Water, Sanitation and Hygiene team was in charge of audio-visual “actions” they focused on the importance of sanitary toilets, hand washing and hygiene practices. “Meena’s Three Wishes” on the theme of water, sanitation and hygiene stole the show! UNICEF staff told children about the importance of safe water, washing hands, and using sanitary toilets instead of the beach. He shared the experiences of the community led total sanitation initiative and how children are the important agents of change for sanitation and hygiene. The presence and voices of children in our office made this day memorable and reinvigorated us as much as entertaining them!